landscape maintenance Archives - Proper Landscaping Inc. 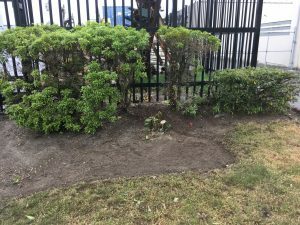 I love soft landscape installations with soil and plants because this kind of work breaks up my usual maintenance routine. Normally, everything goes well but this blog post examines two fails from 2018. When I do all of the work I feel responsible for it. So when, months later, I find out that things didn’t work out I need to know why. Let’s take a look. I remember this awesome morning well because my job was to plant Dahlias at a horse racetrack. 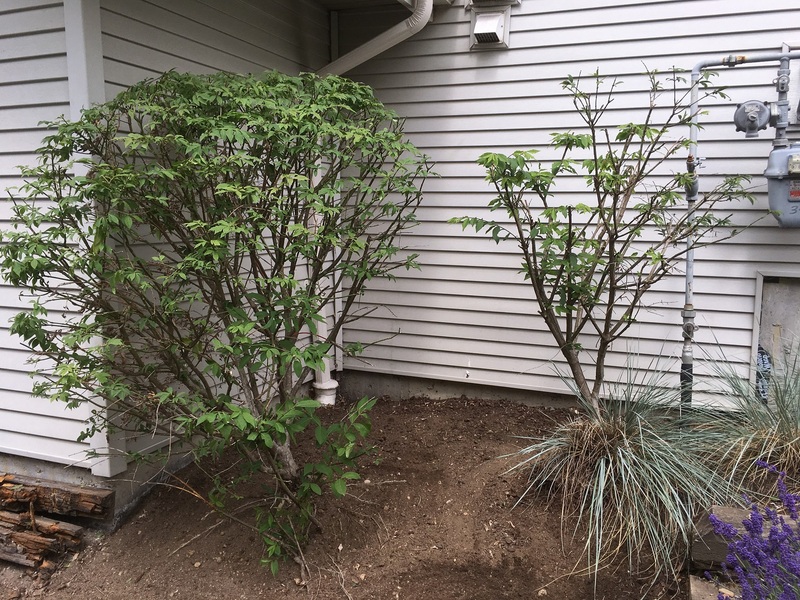 First, I had to remove the dead plants in the planters. Preparations for new flowers in the winner’s circle. Second, I installed new Dahlias; long-stemmed on top and short-stemmed on the bottom. All Dahlias are planted; only watering and clean-up remain. Everything fit nicely and I had more than enough plants so I also planted some Dahlias into pots. 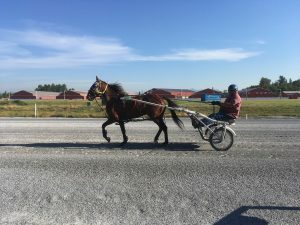 As I worked, many of the female trainers commented on how nice it was to get some colour this close to the racetrack. Of course it was! What worried me was the large truck which came by periodically, spraying the racetrack with a liquid I assumed was water to keep the dust down. I suspect it wasn’t straight water. Once the plants were installed, I top-dressed everything with new soil to give the planters a nice dark look; and to give the plants a little kick because the existing soil looked spent. The last step involved watering. I found a long hose but I had to track down the building maintenance dude to get a water key. 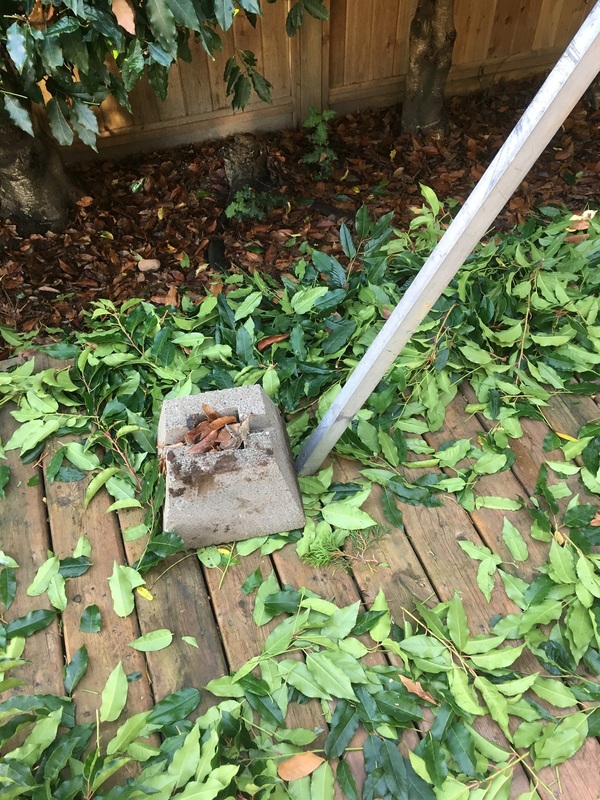 Once I watered the planters, I also hosed off the concrete. This is consistent with good landscape maintenance: always leave your work area clean so the clients don’t even notice your presence. Sadly, several weeks later, the live Dahlias had to be replaced with plastic flowers. 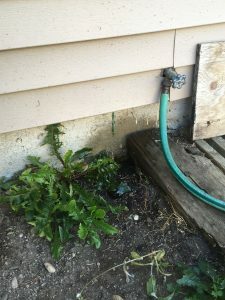 Like most plants, they needed regular watering. 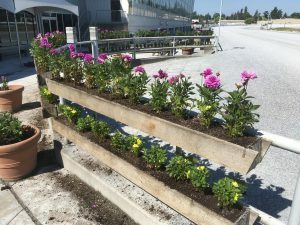 I also suspect that the original soil in the planters was weak. 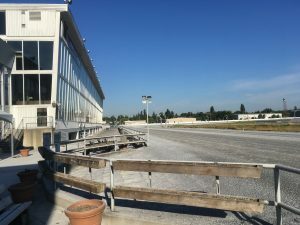 And the racetrack dust also can’t be good for the plants. I didn’t ask but I suspect that the racetrack spraying isn’t done with normal water. There might be additives that help keep the dust down. Like people, plants require water to function properly. The second fail involved a cedar hedge request. 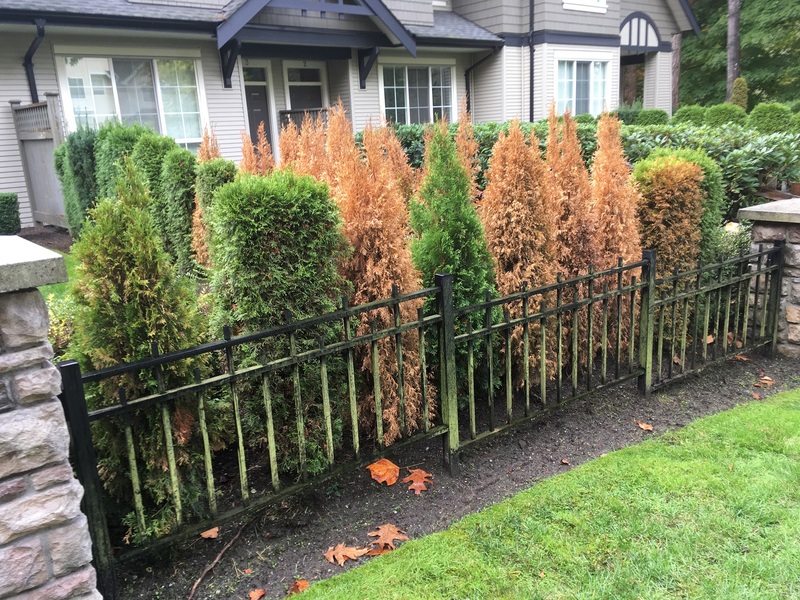 Here the case is 99% clear, the owners didn’t water the new cedars, even though a hose was available by the door. I bought the plants, installed them and watered them in. The rest was up to the owner. Months later I arrived on site and I was crushed because only a few specimens were still green. And while I am not responsible for watering, I did consider this project a waste of money and effort. 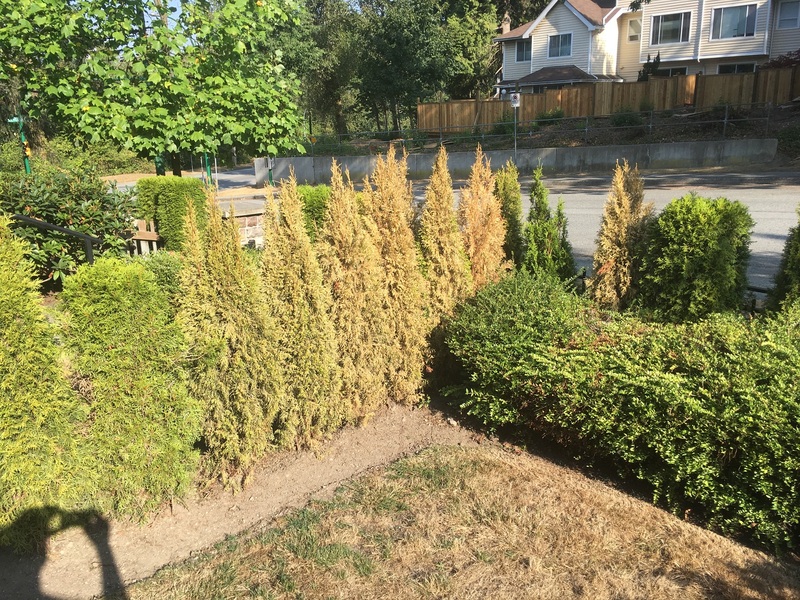 New cedars (Thuja occidentalis ‘Smaragd’) are very thirsty. I have no idea what will replace these dead cedars. I can’t imagine the owners would request more of them. 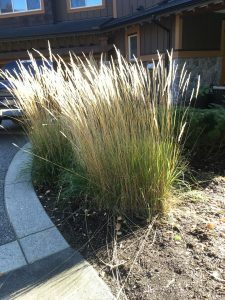 You always do your absolute best with landscape installation projects but there will be a few fails. Overall, 2018 was a great season for new installs. These two fails bothered me for a while but instead of dwelling on them, I wrote a blog post about them. That’s cheaper than therapy. 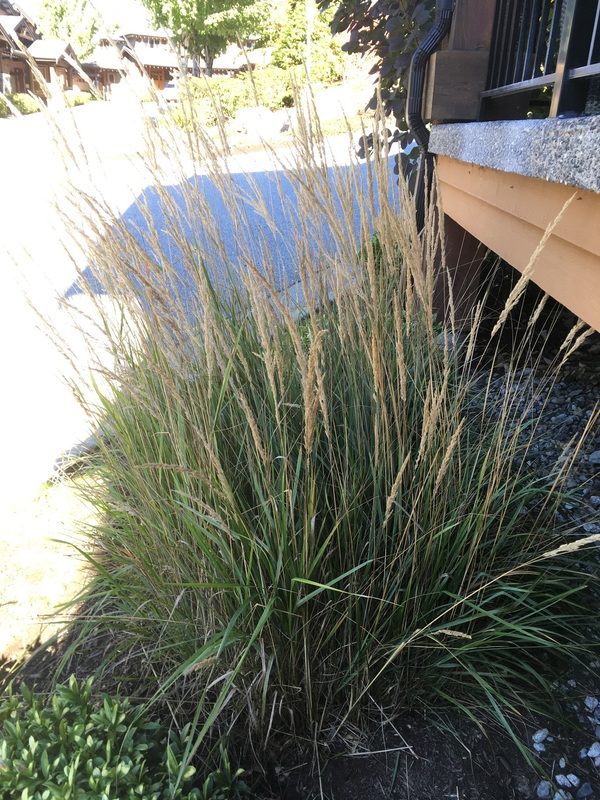 Plants require water just like people so always water-in your newly installed plants. The last week of service before the Christmas break requires focus. 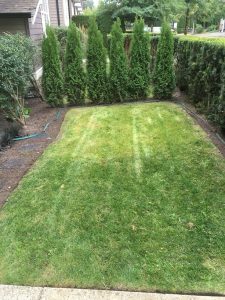 Most people have holidays on their minds but it’s very important to leave your landscapes looking sharp. This is how you do it. Keep it simple. This is a bad time for major projects and heavy pruning. This type of work should be written down in your notebook for January. So what do we do? We check all high-profile entrances and walkways; and inside roadways. 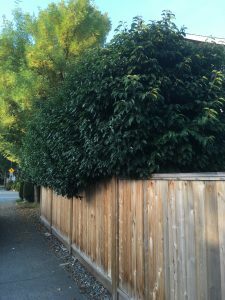 Today I raked out the top boulevard of my site, including leafy debris behind the hedges. Since residents, neighbours and holiday visitors use and drive-by the boulevard, it should look sharp. And today it did. I did a little bit of hand snipping on the tops of Pieris japonica shrubs. Very lightly, just to take out the spiky growth. 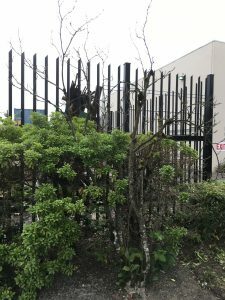 Unless you live in the complex, you can’t tell the shrubs were topped. Before: note the spikes on top. 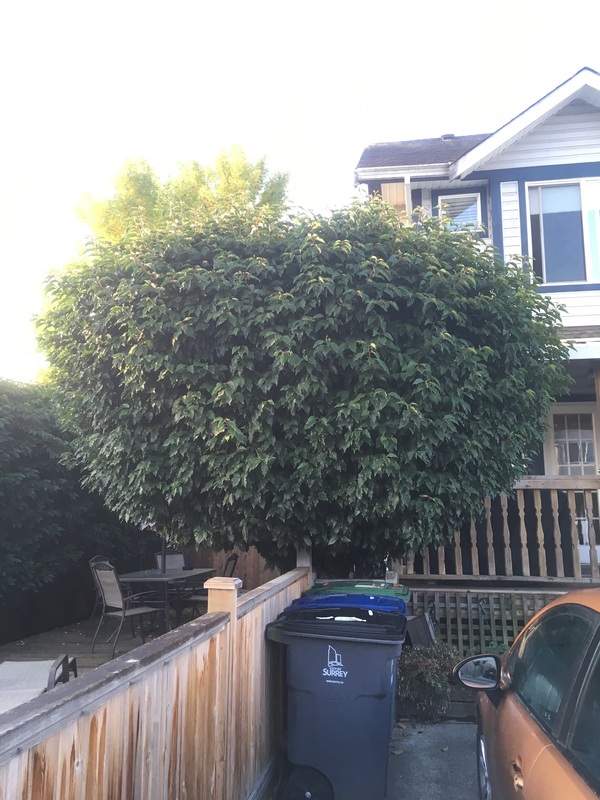 After: it still looks natural after pruning. Once my raking was done, I blew the entire site. This is a perfect time for a good, detailed blow. I normally hurry to get this noisy task out of the way but not today. 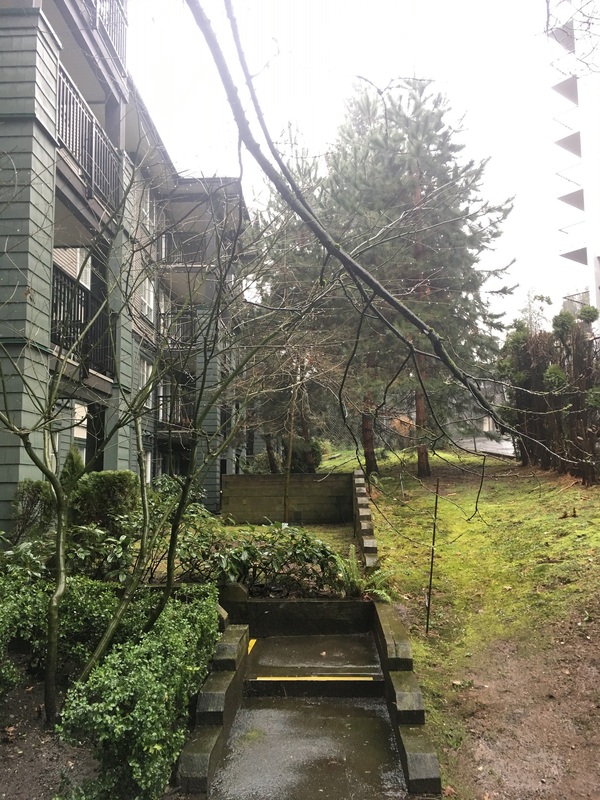 Today everything got blown: the inside roadways, patios and lawns. I also blew the forest buffer zone where leafiness tends to accumulate. After pile pick-up I hit a few weedy patches and touched up some deep edges. The hardest part of the day was cleaning up the garden liaison’s garden. 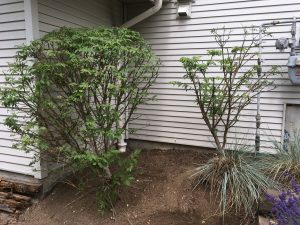 She has a Japanese-style garden and does her own maintenance but I had to clean-up cedar clippings from a few weeks ago. 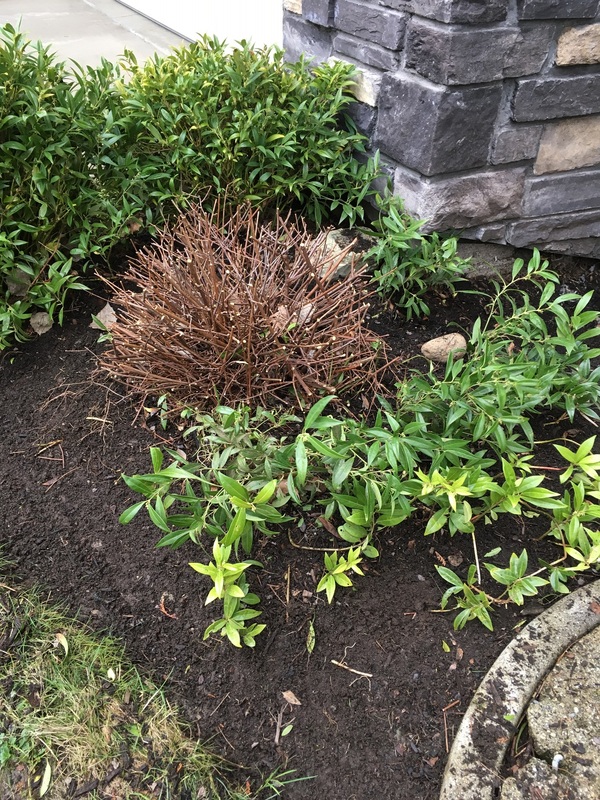 Cedar pruning always generates secondary drop and here I had to hand pick the clippings from inside her Hellebores. Carefully. Note that this sort of work shouldn’t be delegated to your helpers unless they’re experienced and follow directions well. 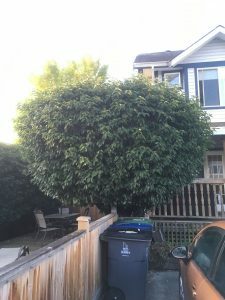 The previous company pruned the liaison’s cedar hedges too hard; and they’re no longer under contract with this strata! I walked the small site at the end of the day to double-check everything. I also noted work tasks for the new year. When I pulled out from the site I was satisfied that it was clean for Christmas. 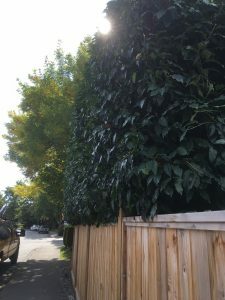 The title of this blog post says ‘classic’ because the home owner was on a budget and had clearly let her hedges go wild. And now she was desperate to reclaim some space and light from her Portuguese laurels (Prunus lusitanica). This is common with homeowners. They start out with huge ambitions but a few years later they get overwhelmed and call in professionals. Then you don’t hear from them again for several seasons which is a mistake. Good, regular maintenance is best. I could tell from the garden weeds that not much happens around the patio other than smoking. Luckily, the lady was still home when I arrived so we could talk about the work and her expectations. This is extremely important so you avoid any nasty misunderstandings. 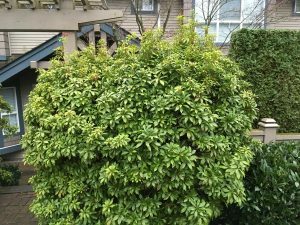 The pruning is easy when you have sharp shears; and the laurel is fairly soft, too. The only glitch was the slick wooden patio in the back. There was no way to anchor the ladder peg. 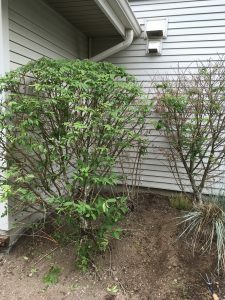 Luckily I found a cement block under the hedge. 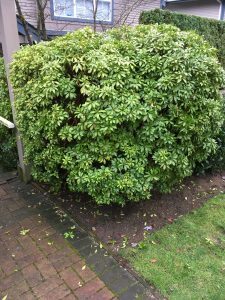 If you read my blogs regularly -and you should!- you will know that I harp on doing great clean-ups that match the pruning effort. Poor clean ups detract from your pruning work. Always clean up well. Final courtesy blow is a given. I left the residence feeling happy with my effort. I just wonder how many seasons they will let it go before calling me back. Regular maintenance is best! I can’t stress that enough. It’s October, 2018, and leaf season is here. Landscape contractors rely on their backpack blowers to clean-up leaf avalanches on their sites. If you drive around you’re bound to see a few a rose-cheeked landscapers blowing for hours. I personally don’t stress about leaves. I love fall and I clean up the leaves as well as I can. Then I return the following week for more. 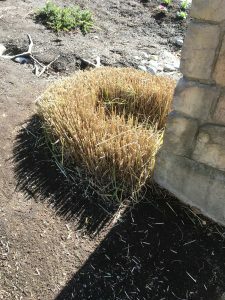 Aside from leaf clean-up blowing, there are two more blowing techniques every landscaper must know. 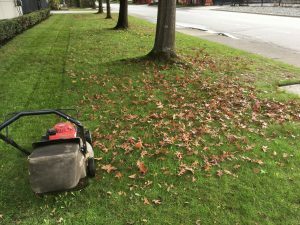 Early in leaf season when the leaf drop isn’t overwhelming, a pre-blow can be a great time saver. 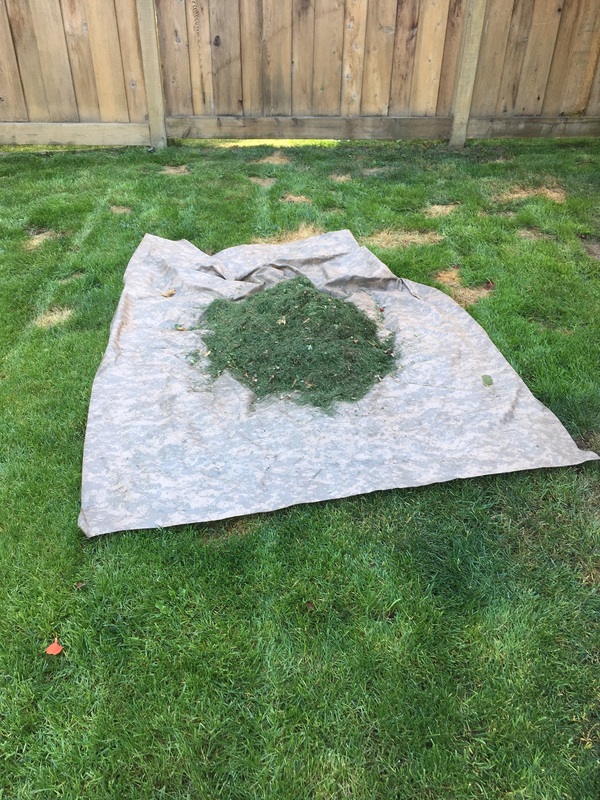 Pre-blow involves a quick blow of your site where leaves are blown onto lawns and then mowed. 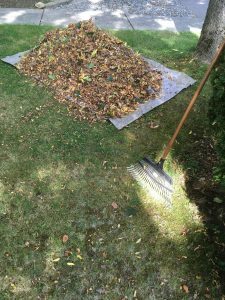 This eliminates time consuming leaf pile pick-up with rakes. Simply mow over the leaves and bag everything. Then all that’s left to do is a final touch up blow. The only issue is judging the right amount of leaves. 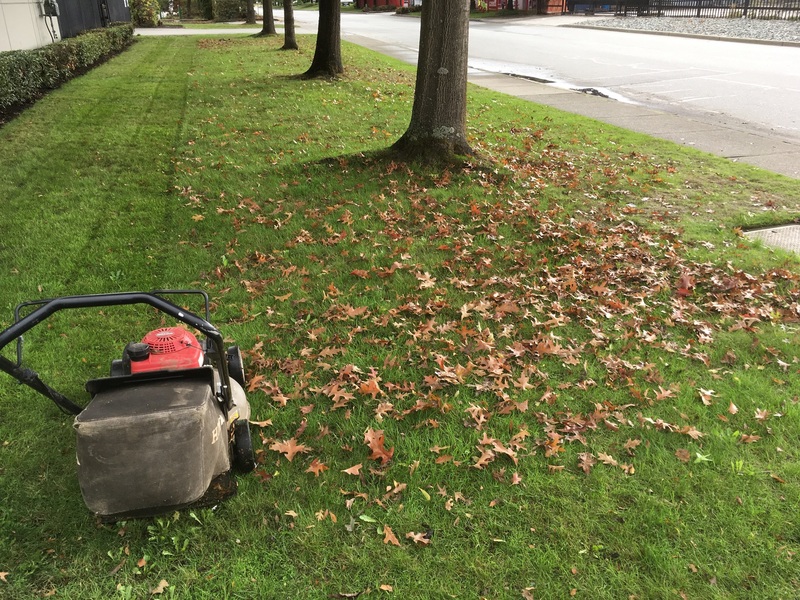 If the leaves really accumulate after your pre-blow, the mower will struggle to shred them when you mow. Don’t kill your mower. That’s why this technique is best used early in the leaf season. 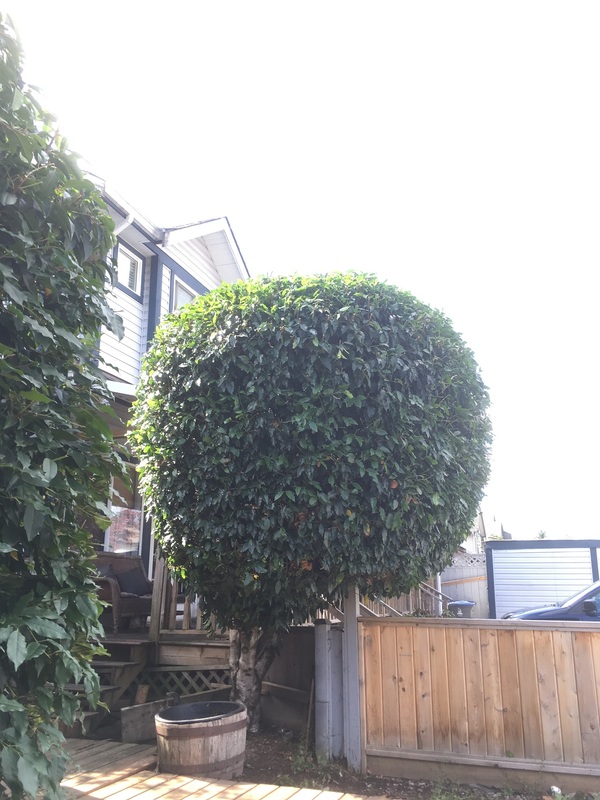 I think it could be used more in landscape maintenance. This is a well executed pre-blow. 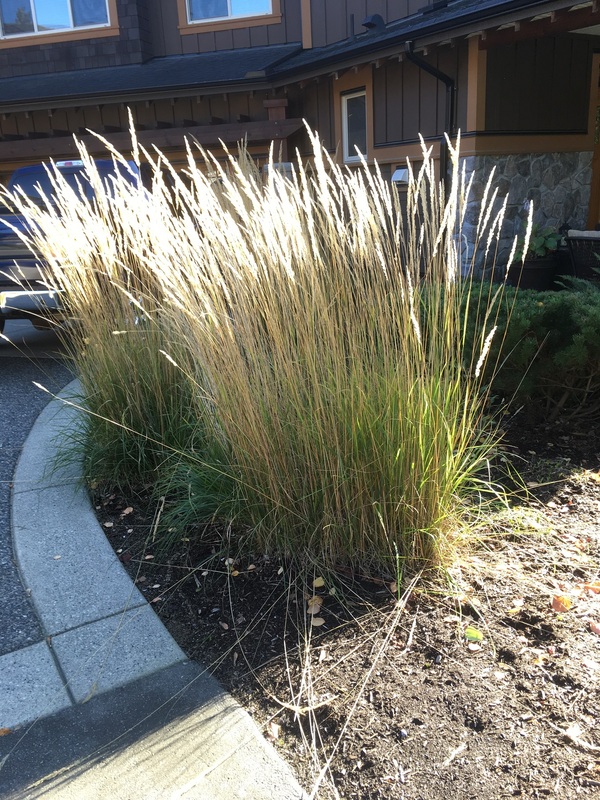 There isn’t enough leafiness to overwhelm the mower engine or to start raking piles. As the name suggests, this is the final courtesy clean-up blow. But I’m finding that many new employees only concentrate on the actual clean-up. With proper training they would know that their final blow also doubles as the final check. 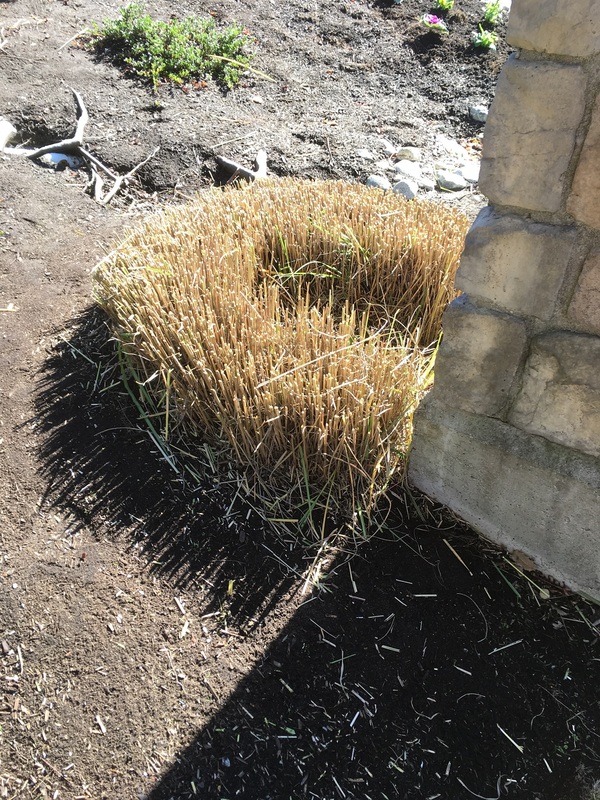 Yes, foremen are responsible for checking their sites in theory but it’s not always easy in practice. That’s because some strata sites are huge and asking the foremen to walk the entire site at the end of the day can be too much. So the worker doing the final blow is responsible for checking everything over as she goes. That includes missed debris piles, full green waste tarps, empty tarps, open gates and missed hand tools. It’s up to the worker to alert the foreman so we avoid calls to the office later. 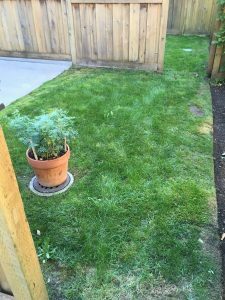 Lawn care mistakes must also be corrected. Mistakes happen. Nobody goes home until missed lawns are mowed and huge mohawks eliminated. Again, I find that new workers aren’t trained to perform final site checks when they blow. Once they get into the habit everything runs smoothly. When a missing hand tool is discovered on site later, it means that the area wasn’t blown or the worker only occupied himself with blowing, not checking. This missed tarp was discovered during the final blow. This yard didn’t get mowed at all. 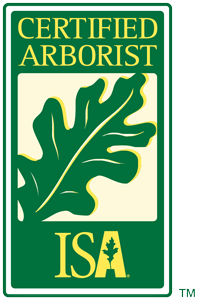 Consider training your landscape workers to perform pre-blows and final blows with site checking. Your whole operation will be smoother. 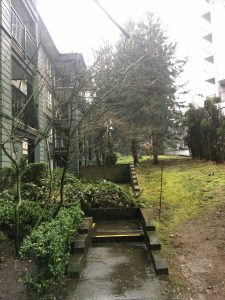 It drives me crazy when I see my landscape installs neglected and suffering from lack of water. It must be the biophilia effect because I feel responsible for the suffering plants. 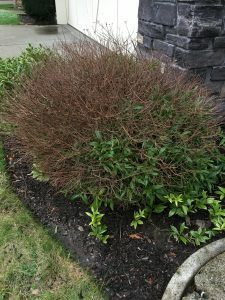 An yet, I can’t do much about it because it’s up to the owners to water their plants. I water them in on install day. This is your main take-away from this blog post: new plants require copious amounts of water to properly establish. As water goes in, roots chase it down and extend. And on it goes but not without water. This is the worst case because I did everything myself. 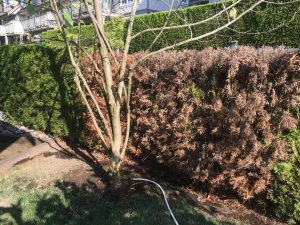 I removed the dead cedars, dug the holes, bought and delivered the new cedars (Thuja occidentalis ‘Smaragd‘), planted them and watered them in. Months later I took this picture with some disgust. Directly behind me was a perfectly functioning garden hose. 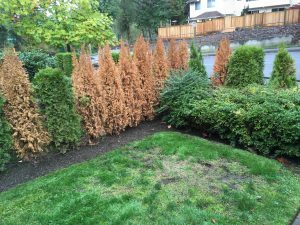 It just takes time to properly soak the cedars once in a while. Cedars are very thirsty in their first year. Because of our summer drought this Magnolia tree exhibited early leaf senescence. With some watering from me it bounced back by pushing out new foliage. The cedars behind the tree weren’t so lucky. To be fair, shading from the Magnolia becomes permanent over time but I suspect lack of water was also a major contributor to this carnage. Note the garden hose in the picture. I have no idea why it can’t be turned on and left to soak the area for twenty minutes. Again, it’s up to the owners to water. Luckily, some owners get it. This unit has two little kids and the owners water. 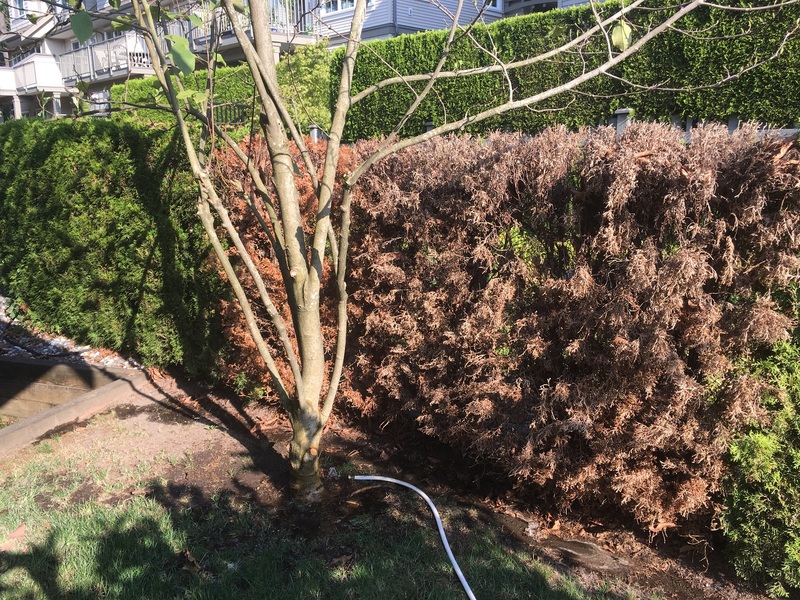 Plus they installed a soaker hose so their new cedar hedge would establish. This space used to be bare with only two stumps to look at and I, literally, paid for this install with my blood. Because the nearby creek breeds a lot of summer mosquitos this project was an adventure. My next blog post will be on my intimate knowledge of insect repellents. 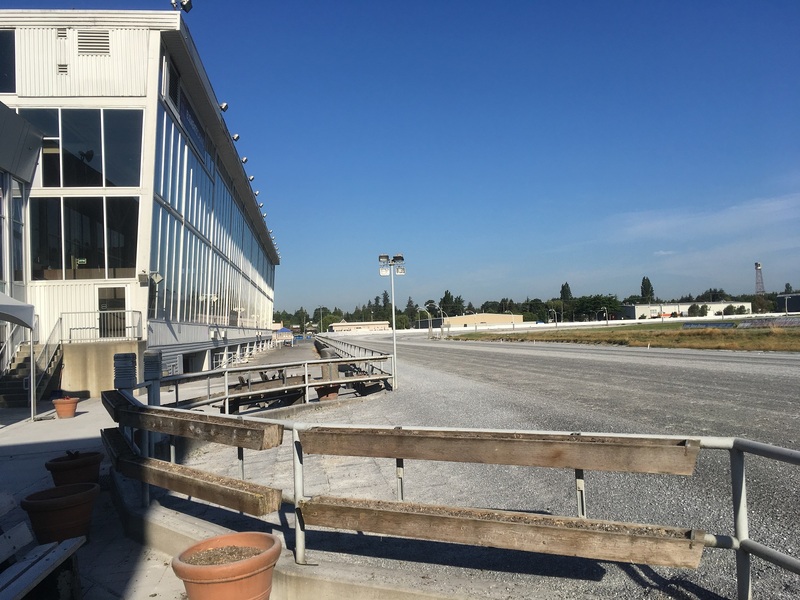 These owners get a gold start for watering. 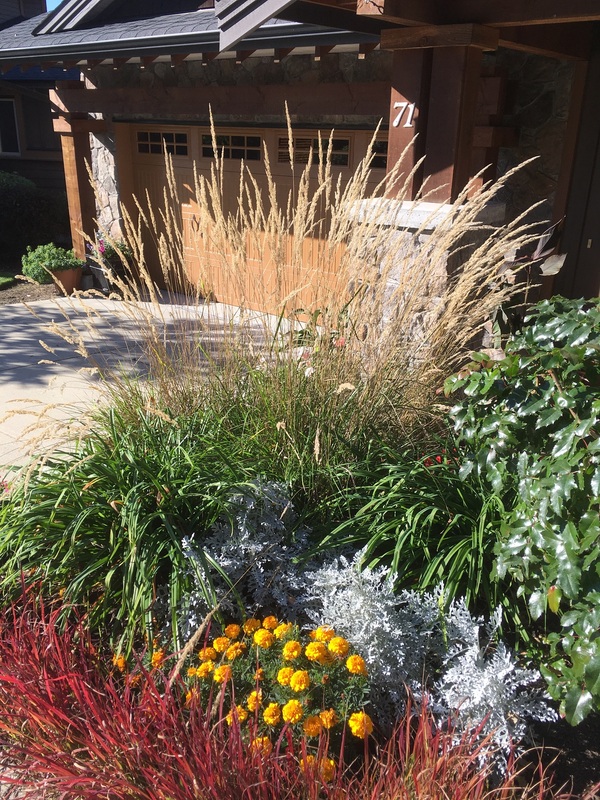 As we ease into fall, there will be more landscape installs. 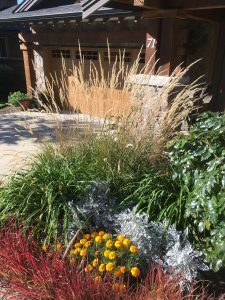 It’s absolutely critical that owners water their new plants. Good plant establishment can only happen with good watering. 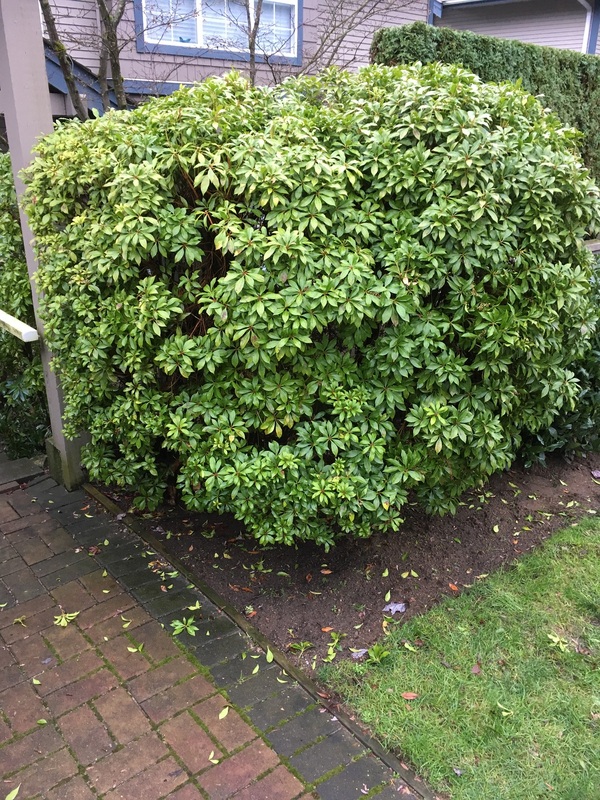 There I was raking out a bed and to get under a rhododendron I had to bend down and use my hands. Seconds later my left thumb was in excruciating pain. Then I quickly clued in: my hand had just passed over a ground nest full of wasps. So I hosed off my thumb for several minutes, finished the day and left for home in a foul mood. My left hand was swelling up with every passing hour. There are many dangers facing landscapers in the field and in summer, insects are danger number one. Still, this was my only sting all season. And as long as I can do my job, I ignore all wasps. It’s usually the residents that panic. One week later I ran into a tree nest full of wasps which is much easier to detect when the wasps are flying in and out. And I was ready, too! I had my spray can ready so I gave it a nice shake and aimed it at the opening. Out came a lot of white foam. This is much easier to spot than…. 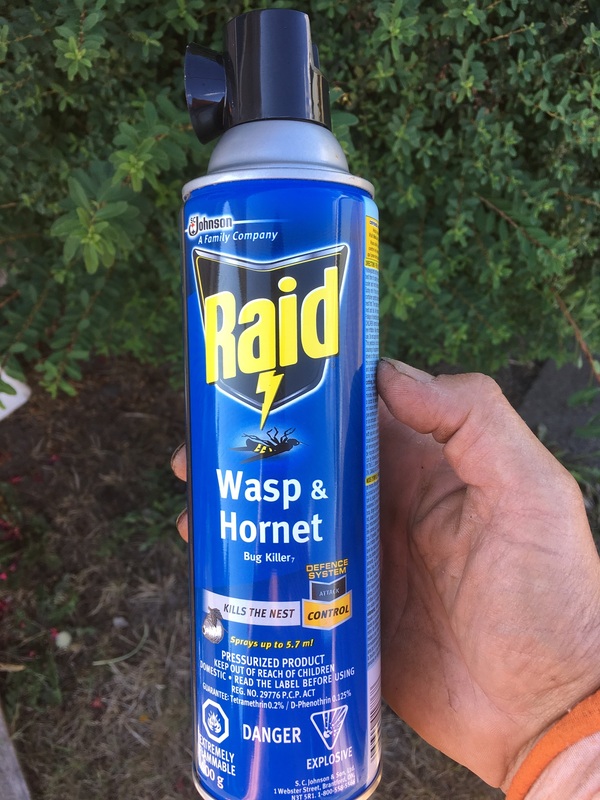 Here is the key point of this blog post: when you buy a spray can for wasps and hornets, buy the gluey stream type not foam. The foam coated the opening and the entire part of the nest facing me. Some wasps even escaped from the opening. Two weeks later I found live wasps still inside the nest. This doesn’t happen with the glue type spray can. The toxic glue comes out in a steady stream and plugs up the nest opening. Case closed. Hint: use goggles and pray that the wind is blowing away from you. 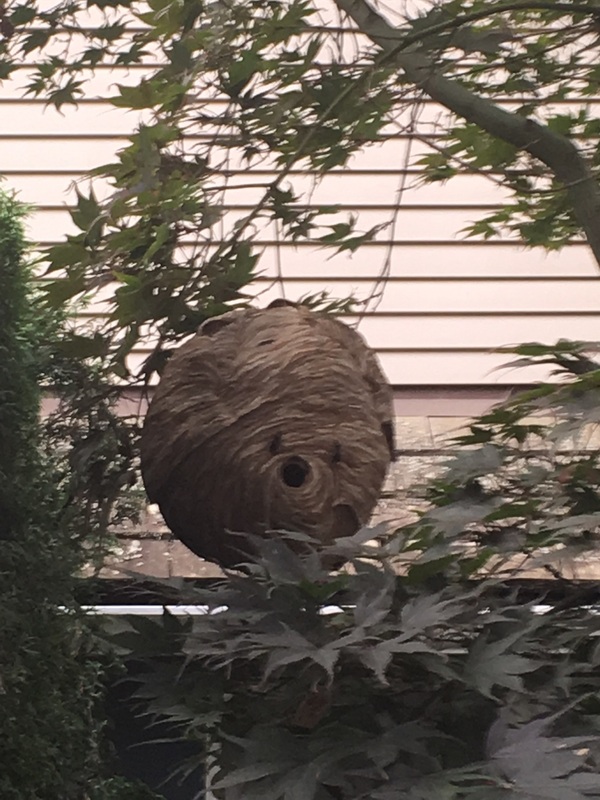 I waited for two weeks before removing the nest. When I examined it, I found two wasps still alive inside. Hours later the pest control technician found some nest leftovers and questioned me about it. Most likely I had just prevented him from generating a fat invoice. Safety first! Late summer wasp problems are common in landscaping so be careful. 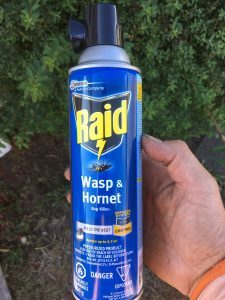 And if you buy a spray can to control the insects, do NOT buy the foam version. Buy this type of spray, NOT foam.